The other day I asked myself: what can I realistically find about my relatives in GenealogyBank? How many details about my family can I discover? 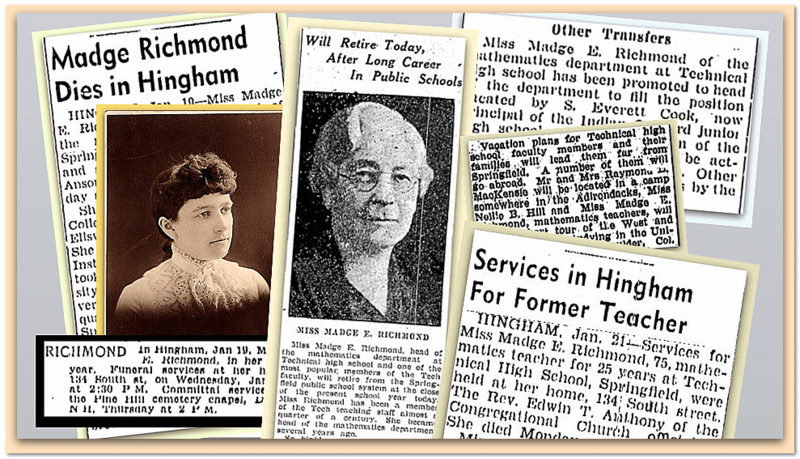 So I decided to find out by searching GenealogyBank’s historical newspaper archives for a family member we know little about: Madge E. Richmond (1866-1942). 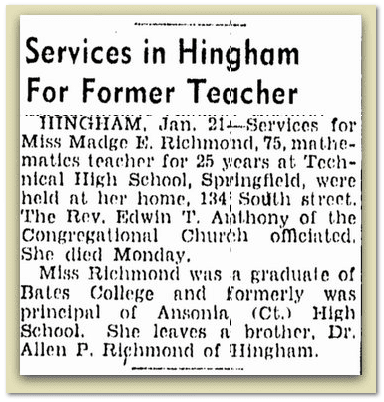 Madge Richmond was a teacher for 25 years; almost all of those years were spent teaching at the Technical High School in Springfield, Massachusetts. 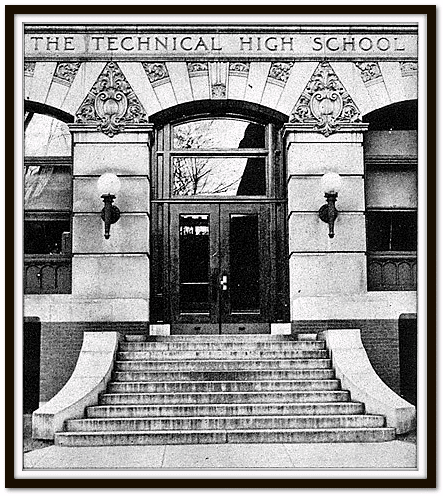 Photo: Technical High School, Springfield, Massachusetts. Credit: Temposenzatempo. Beyond that we had the family traditions of her kindness, intellect and work ethic. We knew little else about her. 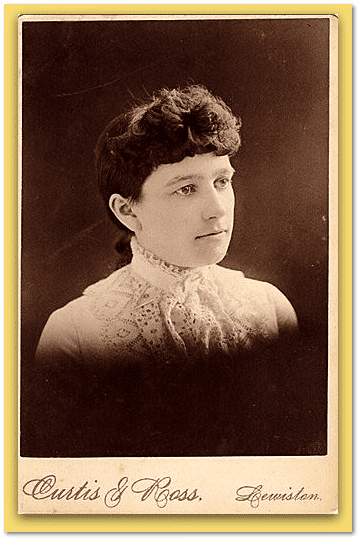 The family has two pictures of her—one as a young woman. The other picture of her was taken in the years after her retirement. 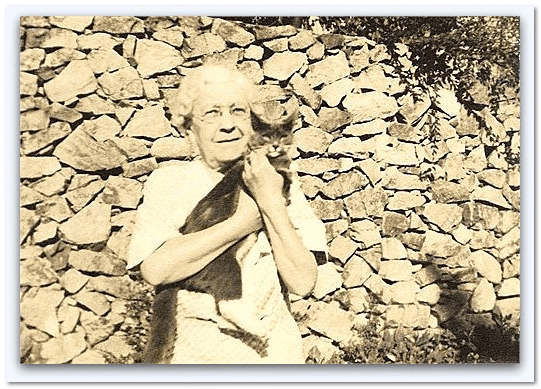 Madge Richmond was an “ordinary person”—your typical relative. She was beloved by the family and the school community where she worked, but otherwise she was an unknown person to the world at large. What could I hope to discover about her in GenealogyBank? Would newspapers have published anything about such a plain, ordinary person? All of our relatives are special to us but—for the most part—unknown beyond our family and friends. In my initial search on GenealogyBank I used only my relative’s name: Madge Richmond. That first and last name search produced 331 record matches—far too many for me to sort through them all. So I decided to try searching for my relative again, this time narrowing my search to only the newspapers in the New England states. 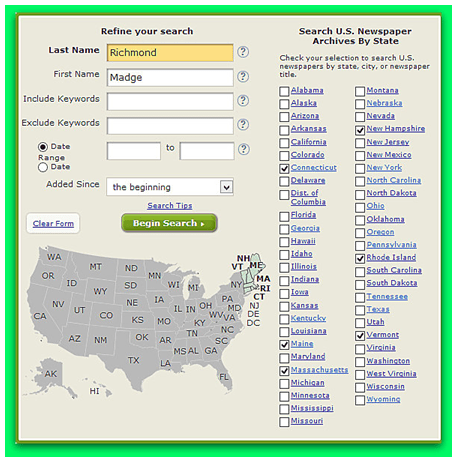 I did this simply by checking all the New England states on GenealogyBank’s newspaper search page. That refined search produced 80 search results. OK—I can work with that. I began looking through the records. The very first record I opened was about was about her! Even better, the article included a photograph of her! It was her retirement notice in the local newspaper. I’d always assumed her middle name was Eleanor—but now I have proof. 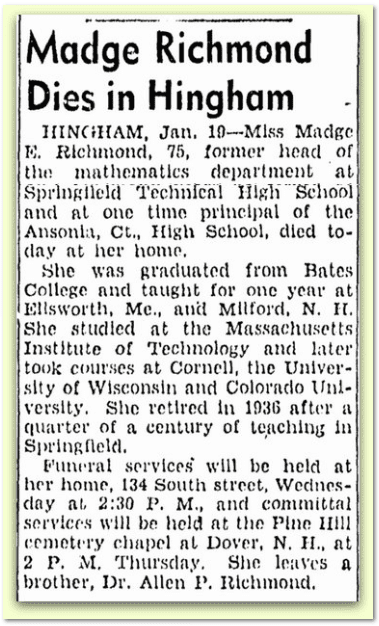 The old newspaper article explained that Madge was the head of the mathematics department, one of the most popular teachers at the school, and was retiring after teaching for nearly 25 years. As I looked through more of the search results, I found dozens of mentions of Madge in news articles about school events, lists of faculty and the like. All of these stories, clues and little details I found in the newspaper archives helped me learn about a relative I didn’t know very well. 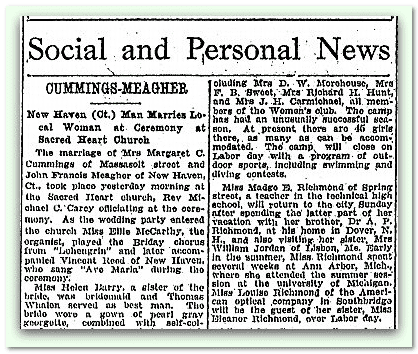 Here are some of the newspaper articles I found in GenealogyBank that gave me more of Madge’s life story. These historical newspaper articles have given me a more complete picture of Madge’s life—and a very nice portrait of her. Here are some of the key moments and events from her life, as captured in newspaper articles. Great. I knew she was a teacher in Springfield, Massachusetts, but I didn’t know that she was also a teacher in Dover, New Hampshire. 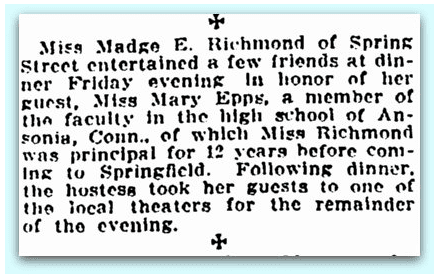 OK—here’s another fact new to me: Madge was principal of Ansonia High School (Ansonia, Connecticut) for 12 years prior to coming to Springfield. More information: in the summer of 1915 she attended Cornell University. She liked Cornell so much that she and two friends went again the next year. She spent Christmas of 1917 with her brother and his wife: Dr. and Mrs. Allen Pierce Richmond of Dover, New Hampshire. 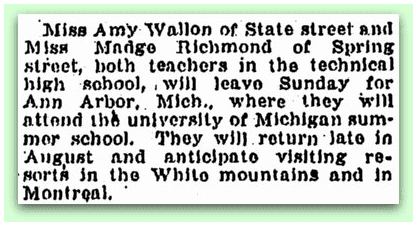 In 1915 Madge attended the summer session at the University of Michigan. She also visited her brother Dr. A.P (Allen Pierce) Richmond in Dover, New Hampshire, and her sister Mrs. William Jordan (Abigail May Richmond) in Lisbon, Maine. So, she also attended the University of Michigan. My grandmother— Madge’s niece—was an accountant at the American Optical Company in Southbridge, Massachusetts—and in Boston, Massachusetts? The social briefs in newspapers have been a real goldmine of information about Madge Richmond and the family! 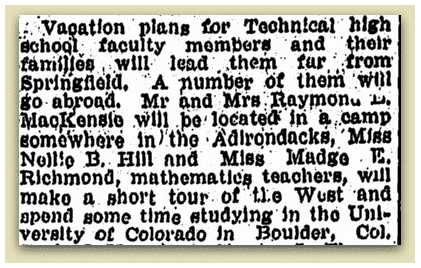 In 1921 she went to study at the University of Colorado in Boulder. She left on 16 July 1921 for Colorado. In 1929 she would go down to St. Augustine, Florida, traveling through the Shenandoah Valley on the trip down and along the coast on the way back. She planned to stay at the St. Augustine Hotel. 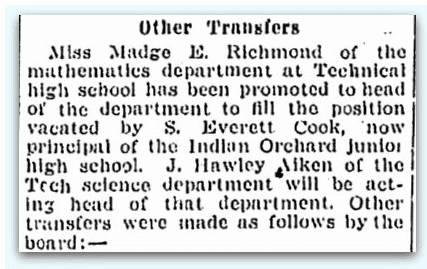 In 1934 she was named the Head of the Mathematics Department at Tech High School. Boston Herald (Boston, Massachusetts), 20 January 1942, page 17. And finally, in these three old newspaper articles, we learn of her death and the funeral arrangements. That’s an incredible amount of genealogical and family history information I found in old newspaper articles—lots of stories, lots of details about her life—that have turned Madge Richmond from just another relative (with only name, birth and death dates) on the family tree into a member of the family that we know and understand better. Dig into GenealogyBank’s newspaper archives to see what family history discoveries you can make and bring your family tree to life! Sometimes tributes written by former students, long-time friends, etc., were published in later newspapers. You might even be surprised to find stories about her or her death notice published in newspapers far away from her hometown! So limiting your search to just the state where she lived could make you miss some other clue about her! Thanks for using Madge as an example, Tom! I have two stories to add–from Pop. He recalled that he was intimidated by her as a small child, as she had white hair early in life and was somewhat severe in her approach to little boys. What he dreaded most was that she would quiz him on “sums” and always find him lacking. He always joked that she was the reason he was a little math phobic. The other story relates to her work at the Technical School. The school served many immigrant boys who were being “tracked” into blue collar work–she would select the most promising and tutor them, helping them to get into college. At least one family was so grateful that they changed their eastern European name to Richmond, in her honor! Peggy – thank you for those terrific stories. Wow – they changed their last name to “Richmond” in her honor. That’s huge. What a tribute to her. I’ll do some research and see if I can discover just who that family was.